Human social behavior has an evolutionary basis. This was the thesis in Edward O. Wilson’s book “Sociobiology” that caused such a stir, even though most evolutionary biologists accept that at least some social behaviors, like altruism, could be favored by natural selection. 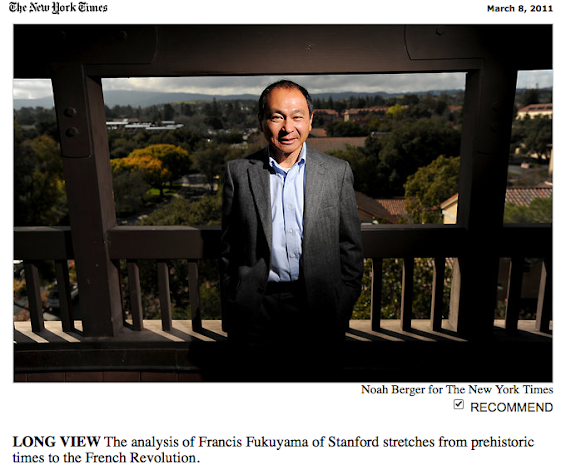 In a book to be published in April, “The Origins of Political Order,” Francis Fukuyama of Stanford University presents a sweeping new overview of human social structures throughout history, taking over from where Dr. Wilson’s ambitious synthesis left off. Dr. Fukuyama, a political scientist, is concerned mostly with the cultural, not biological, aspects of human society. But he explicitly assumes that human social nature is universal and is built around certain evolved behaviors like favoring relatives, reciprocal altruism, creating and following rules, and a propensity for warfare. Because of this shared human nature, with its biological foundation, “human politics is subject to certain recurring patterns of behavior across time and across cultures,” he writes. It is these worldwide patterns he seeks to describe in an analysis that stretches from prehistoric times to the French Revolution. Previous attempts to write grand analyses of human development have tended to focus on a single causal explanation, like economics or warfare, or, as with Jared Diamond’s “Guns, Germs and Steel,” on geography. Dr. Fukuyama’s is unusual in that he considers several factors, including warfare, religion, and in particular human social behaviors like favoring kin. Dr. Melzer praised Dr. Fukuyama’s view that societies develop politically in several different ways, followed by selection of the more successful, rather than marching along a single road to political development. “It’s the kind of theory situated between the hyper-theory of Marx or Hegel and the thick description that certain anthropologists and historians aim at,” he said. Georg Sorensen, a political scientist at the University of Aarhus in Denmark, also called the book a magnum opus, saying that it provides “a new foundation for understanding political development.” It is neither Eurocentric nor monocausal, but provides a complex, multifactor explanation of political development, Dr. Sorensen said. “In terms of discussing political order this will be a new classic,” he said. Dr. Fukuyama burst into public view in 1989 with his essay “The End of History,” a title widely misunderstood to mean that no major turning points in history would occur in future. In fact the essay concerned the evolution of human societies and the belief by Hegel and Marx that history would be fulfilled when the ideal political order was achieved — the liberal state, in Hegel’s view; communism, in Marx’s. Unlike some scholars who flame out after a single brilliant book, Dr. Fukuyama has produced a steady and wide-ranging body of work, delving into sociology with his book “Trust” (1996) and into biotechnology with “Our Posthuman Future” (2003). He is also unusual in combining academic theory with a practical interest in economic development. He is a frequent consultant to theWorld Bank and other agencies. He has a political dimension, too, and is often associated with the neoconservative movement. He signed a letter after the Sept. 11 attacks urging President Bush to overthrow Saddam Hussein. But by 2006 he had become a critic both of the invasion of Iraq and of the neoconservative movement, which he said he could no longer support. The book traces the development of political order from the earliest human societies, which were small groups of hunter-gatherers. The first major social development, in Dr. Fukuyama’s view, was the transition from hunter-gatherer bands to tribes, made possible by religious ideas that united large numbers of people in worship of a common ancestor. Since a tribe could quickly mobilize many men for warfare, neighboring bands had to tribalize too, or be defeated. Warfare also forced the second major social transition, from tribe to state. States are better organized than tribes and more stable, since tribes tend to dissolve in fighting after the death of a leader. Only because states offered a better chance of survival did people give up the freedom of the tribe for the coercion of the state. Much of Dr. Fukuyama’s analysis concerns how states develop from tribes. This transition, in his view, is affected by geography, history, and in particular by the order in which the different institutional components of the state are put in place. Depending on the order of events, several very different kinds of state emerged in China, India, the Islamic world and Europe, and even within Europe there have been several major variations on a common theme. The first volume of “The Origins of Political Order” ends with the 18th century. A second volume will bring the story to the present day. In conversation Dr. Fukuyama makes clear that the modern liberal state is still in his view the end of history. The Chinese political system, since it has no way of holding its rulers accountable, is in the long run unstable, in his view. “The Chinese have reasonably good technocratic leadership. They can move faster than a democracy and cut through interest groups. But that leaves them vulnerable to bad emperor problems. They think the last bad emperor they had was Mao,” he said. Dr. Fukuyama says he has been at pains not to write Whig history, in which the past is presented as an inevitable progression toward liberal democracy. He describes the many different states that arose in Europe in order to make clear that the English path was only one among many. Indeed the road to democracy was wholly unexpected.